The Friends of Eddie Coyle is a 1973 crime film directed by Peter Yates and starring Robert Mitchum and Peter Boyle. The screenplay by Paul Monash was adapted from the novel of the same name by George V. Higgins. 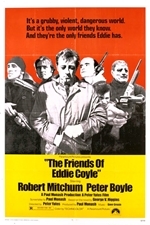 The Friends of Eddie Coyle was well-reviewed on its initial release and continues to be among the most highly regarded crime films of the 1970s. Roger Ebert of the Chicago Sun-Times gave it four stars, his highest rating, while Vincent Canby of The New York Times also reviewed it favorably, calling it "a good, tough, unsentimental movie". Both reviewers singled out Mitchum's lead performance as a key ingredient of the film's success.